No difference. Both are stored in tempdb. @table_variables behave more as though they were part of the current database than #temp tables do. For table variables (since 2005) column collations if not specified explicitly will be that of the current database whereas for #temp tables it will use the default collation of tempdb (More details). Additionally User-defined data types and XML collections must be in tempdb to use for #temp tables but table variables can use them from the current database (Source). In a contained database temporary table data is collated in the collation of the contained database. All metadata associated with temporary tables (for example, table and column names, indexes, and so on) will be in the catalog collation. Temporary tables may not refer to user-defined types, XML schema collections, or user-defined functions. @table_variables can only be accessed within the batch and scope in which they are declared.#temp_tables are accessible within child batches (nested triggers, procedure, exec calls).#temp_tables created at the outer scope (@@NESTLEVEL=0) can span batches too as they persist until the session ends. Neither type of object can be created in a child batch and accessed in the calling scope however as discussed next (global ##temp tables can be though). @table_variables are created implicitly when a batch containing a DECLARE @.. TABLE statement is executed (before any user code in that batch runs) and are dropped implicitly at the end. Although the parser will not allow you to try and use the table variable before the DECLARE statement the implicit creation can be seen below. #temp_tables are created explicitly when the TSQL CREATE TABLE statement is encountered and can be dropped explicitly with DROP TABLE or will be dropped implicitly when the batch ends (if created in a child batch with @@NESTLEVEL > 0) or when the session ends otherwise. NB: Within stored routines both types of object can be cached rather than repeatedly creating and dropping new tables. There are restrictions on when this caching can occur however that are possible to violate for #temp_tables but which the restrictions on @table_variables prevent anyway. The maintenance overhead for cached #temp tables is slightly greater than for table variables as illustrated here. This is essentially the same for both types of object. It is stored in the system base tables in tempdb. It is more straightforward to see for a #temp table however as OBJECT_ID('tempdb..#T') can be used to key into the system tables and the internally generated name is more closely correlated with the name defined in the CREATE TABLE statement. For table variables the object_id function does not work and the internal name is entirely system generated with no relationship to the variable name. The below demonstrates the metadata is still there however by keying in on a (hopefully unique) column name. For tables without unique column names the object_id can be determined using DBCC PAGE as long as they are not empty. Operations on @table_variables are carried out as system transactions, independent of any outer user transaction, whereas the equivalent #temp table operations would be carried out as part of the user transaction itself. For this reason a ROLLBACK command will affect a #temp table but leave the@table_variable untouched. Both generate log records to the tempdb transaction log. A common misconception is that this is not the case for table variables so a script demonstrating this is below, it declares a table variable, adds a couple of rows then updates them and deletes them. Because the table variable is created and dropped implicitly at the start and the end of the batch it is necessary to use multiple batches in order to see the full logging. Don't run this on a busy server. As far as I've been able to discern operations on both generate roughly equal amounts of logging. 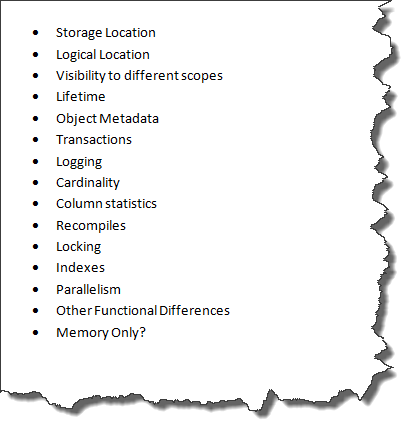 Whilst the quantity of logging is very similar one important difference is that log records related to #temptables can not be cleared out until any containing user transaction finishes so a long running transaction that at some point writes to #temp tables will prevent log truncation in tempdb whereas the autonomous transactions spawned for table variables do not. Many of the execution plans involving table variables will show a single row estimated as the output from them. Inspecting the table variable properties shows that SQL Server believes the table variable haszero rows (Why it estimates 1 row will be emitted from a zero row table is explained by @SQL Kiwi here). Plan shows accurate estimated row count following deferred compile. Having a more accurate table cardinality doesn't mean the estimated row count will be any more accurate however (unless doing an operation on all rows in the table). SQL Server does not maintain column statistics for table variables at all so will fall back on guesses based upon the comparison predicate (e.g. that 10% of the table will be returned for an = against a non unique column or 30% for a >comparison). In contrast column statistics are maintained for #temp tables. SQL Server maintains a count of the number of modifications made to each column. If the number of modifications since the plan was compiled exceeds the recompilation threshold (RT) then the plan will be recompiled and statistics updated. The RT depends on table type and size. - If n <= 500, RT = 500. - If n > 500, RT = 500 + 0.20 * n.
- If n < 6, RT = 6. - If 6 <= n <= 500, RT = 500. - RT does not exist. Therefore, recompilations do not happen because of changes in cardinalities of table variables. the KEEP PLAN hint can be used to set the RT for #temp tables the same as for permanent tables. The net effect of all this is that often the execution plans generated for #temp tables are orders of magnitudes better than for @table_variables when many rows are involved as SQL Server has better information to work with. NB: For cached temporary tables in stored procedures the recompilation story is much more complicated than described above. See Temporary Tables in Stored Procedures for all the gory details. It has been stated that table variables do not participate in locking. This is not the case. Running the below outputs to the SSMS messages tab the details of locks taken and released for an insert statement. The impact of this on locking might be quite minor however. Neither of these return results in index key order indicating that SQL Server used an allocation ordered scan for both. The locking output for the table variable is indeed extremely minimal as SQL Server just acquires a schema stability lock on the object. But for a #temp table it is nearly as light in that it takes out an object level S lock. when run outside of an explicit user transaction for both cases the only lock returned when checkingsys.dm_tran_locks is a shared lock on the DATABASE. On uncommenting the BEGIN TRAN ... ROLLBACK 26 rows are returned showing that locks are held both on the object itself and on system table rows to allow for rollback and prevent other transactions from reading uncommitted data. The equivalent table variable operation is not subject to rollback with the user transaction and has no need to hold these locks for us to check in the next statement but tracing locks acquired and released in Profiler or using trace flag 1200 shows plenty of locking events do still occur. Additionally table variables do not support INCLUDEd columns or filtered indexes. Queries that insert into (or otherwise modify) @table_variables cannot have a parallel plan,#temp_tables are not restricted in this manner. #temp_tables cannot be used inside a function. @table_variables can be used inside scalar or multi-statement table UDFs. @table_variables cannot have named constraints. As stated at the beginning both get stored on pages in tempdb. However I didn't address whether there was any difference in behaviour when it comes to writing these pages to disc. And monitoring writes to the tempdb data file with Process Monitor I saw none (except occasionally ones to the database boot page at offset 73,728). After changing 250 to 251I began to see writes as below. Showing that 192 pages were written to disc and the dirty flag cleared. Ir also shows that being written to disc doesn't mean that pages will be evicted from the buffer pool immediately. The queries against this table variable could still be satisfied entirely from memory. 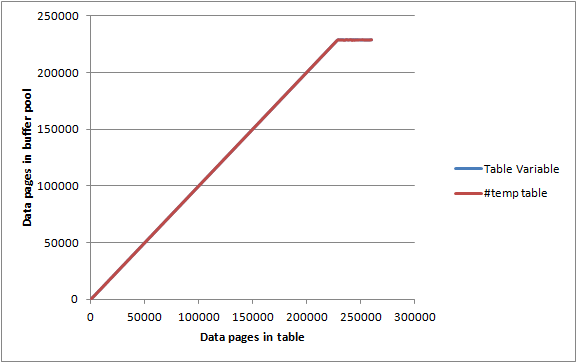 On an idle server with max server memory set to 2000 MB and DBCC MEMORYSTATUS reporting Buffer Pool Pages Allocated as approx 1,843,000 KB (c. 23,000 pages) I inserted to the tables above in batches of 1,000 rows/pages and for each iteration recorded. Both the table variable and the #temp table gave nearly identical graphs and managed to pretty much max out the buffer pool before getting to the point that they weren't entirely held in memory so there doesn't seem to be any particular limitation on how much memory either can consume.